Download the official Trail map and brochure. Click here to read a recent feature article on the Trail, published in the August 5, 2018 Burlington Free Press. 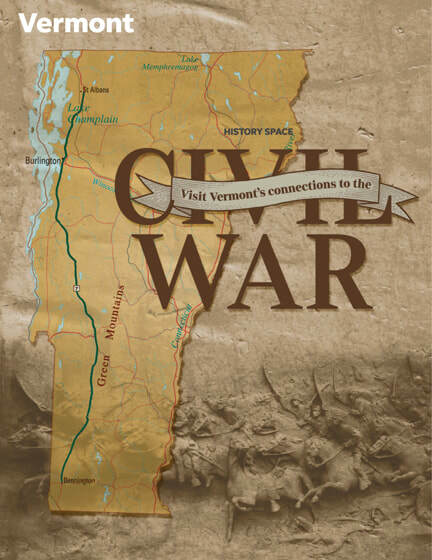 Bennington Museum contains Civil War stories and artifacts, including some for George Stannard, as well as Clyde du Vernet Hunt’s famed statue “The Lincoln Trilogy.” Vermont’s first Veterans’ Home, 1887, with a graveyard including veterans from every Vermont Civil War Regiment, is just North of the Museum on Route 7. Bennington is where young newspaperman William Lloyd Garrison started the anti-slavery Journal of the Times in 1828, which later became the impetus for the anti-slavery movement, The Liberator, published 1831-1865. Hildene, home of Robert Todd Lincoln. The Lincoln family also had reservations at The Equinox Hotel for the week after Lincoln’s assassination. They had vacationed there the two prior years. The famous Bardwell Hotel was a gathering place for numerous important Civil War figures, both North and South. Rutland includes the home of General Wheelock Veazey, and the Fairgrounds were the site for training of Lt. Col. William Y.W. Ripley’s famous 1st U.S. Sharpshooters and mustering site for departing troops. Ripley’s younger brother, Brig. Gen. Edward Hastings Ripley, led the Union Army into Richmond, the Confederate capitol. These and six other sites in present-day downtown Rutland make up several buildings and sites with direct and interrelated ties to the Civil War and its participants, to make up the Rutland Civil War Driving / Walking Tour. Gives a picture of Rutland downtown before, during and after the War. Brings attention to some of the many notables who both served honorably, and also built the town to be what it has become. Provides visitors with a pleasant, short drive and walk, to showcase the rich Civil War history of the downtown Rutland area. Birthplace of Stephen Douglas, the Great Debater and Lincoln’s opponent in 1860 election. The home is currently the site of the Brandon Welcome Center and the Brandon Museum. Famous public address site, the Congregational Church, with Wm. Lloyd Garrison and Frederick Douglass. It was the site of The Great Convention, abolitionist event of July 1863. Middlebury College 1860 commencement speaker Edward Everett, Mass. Governor and Harvard President, gave the main address at Gettysburg cemetery just before Lincoln’s Gettysburg Address. The College graduated Alexander Twilight, the first black person to earn a degree in America. Deep connections to Abolitionist John Brown. Very large crowd attending Brown’s funeral procession back to his North Elba, NY farm for burial. He had frequent trading visits, with his 20 children over the years prior. Vergennes Railroad Depot – oldest depot in VT – received Brown’s casket en route to NY. Main Street downtown contains some of original trading area used by John Brown family. Adams Ferry | Arnold’s Bay Road | Panton. Historic Marker on site. Ferry crossing at Arnold’s Bay to NY State, for John Brown’s body returning to his North Elba farm for burial. A State marker is at the site. A documented stop on the Underground Railroad, is now the Rokeby Museum. Downtown Ferrisburgh Park also has a historic marker for Frederick Douglass speech at Town Hall in July 1843. The incomparable Shelburne Museum. Two Civil War-era homes, the Dutton House and the Settlers House, show daily life of the time. Some Civil War connections with the Webb family and Shelburne Farms as well. Battery Park with its statue of Gen. William Wells was also a drilling site for Capt. John Lonergan’s troops, many later becoming Fenian members. Lakeview Cemetery contains monuments for Generals Oliver Otis Howard and William Wells, as well as the large family plot for Gen. George Stannard, hero of Gettysburg. His is the only statue in the Cemetery in human form. The Hill area of the city has homes of Generals Wells and Howard and the G.G. Benedict House, from the Civil War historian and later publisher and owner of The Burlington Free Press for 40 years. Site of many woolen mills that provided fabric for Union uniforms and blankets. The General George Stannard House (and farm site) and the Milton Historical Museum, with its monument to all of Milton’s Civil War served and fallen. Monument at the birthplace of General George Jerrison Stannard. Saint Albans Museum and Taylor Park, main site of the famous St. Albans Raid of 1864, the Northernmost land battle of the Civil War. Many buildings original to Civil War remain, including the current One Federal/The Foundry Restaurant. This former foundry was first operated, then owned by Gen. George Stannard. A substantial portion of Stannard’s home at the time still stands. 1864 Saint Albans Raiders’ Escape Route | Rte 105 North of St. Albans to 2.5 miles North of Route 104 intersection. On to Canada via back roads. Sheldon Road (current VT Route 105) was the escape route for Confederate Raiders of 1864, including the wooden bridge they attempted to burn. Escapees fled into Canada through Highgate,Vermont. NOTES: Special thanks to Howard Coffin, author of Something Abides: Discovering the Civil War in Today's Vermont. All information is current as of June 2018. Some sites may charge admission or have seasonal/limited hours.